Having a bio and lily pond in your home can be a great way of enhancing the beauty of the landscape while also ensuring a breadth of natural environment. Garden ponds are also becoming quite popular with commercial establishments. Having such features in your space can offer you an ideal place to keep different species of aquatic plants other than just varieties of water lily. Another benefit of having a bio and lily pond is, you let the plants do the natural cleaning of the pond for a more fulfilling experience. Bio and lily ponds offer lush aquatic habitats for quite a number of plants and even fish species. Some of the plants that could work magic in, on or around your pond include, Iris, Arrowhead plant, floating plants, umbrella palm, and cattail among several others. To give the pond a luxurious touch, you can also choose to include lighting at certain spots. Despite the style or theme that you intend to portray with your bio and lily pond, we can successfully bring it out more professionally and creatively. We understand that every client usually has their own preferences and needs when it comes to landscaping projects. We have a wide portfolio of custom styles of bio and lily ponds to choose from. The designs come in various shapes and sizes to suit different spaces. However, our designers can also create one of a kind that only meets your personal expectations. The design of the pond is the fingerprint that will determine how the final feature will look and should represent all your expectations. We always give special attention to every detail so that you get the ultimate bio and lily pond of your dreams. Some of the designs to choose from include, Lotus on Orange, Blue and White Garden, Hyde Vale, Wildflower pond among others. Our designers will also advice you on some of the best features to consider for your pond. In order to bring the imagination of a bio and lily pond into reality, there are several equipment and accessories required. We have sourced high quality supplies for the construction, installation and maintenance of garden ponds from the best manufacturers for convenience and accountability in every product and service that we deliver. Garden ponds are generally considered to be chemical-free but, sometimes the kind of equipment and supplies that you use for making improvements or its management could hinder natural growth and interfere with aquatic health. That is why our experts have put together the best and recommended products that are eco-friendly and energy-efficient. Having been involved in building and installation of garden ponds for many years, we understand the best procedures to undertake in bringing out the best. In fact, we can construct and install ponds in different shapes and sizes for both homes and business property. Sometimes, you may have created the design by yourself and need a professional to actualize it. Our experts can build your design to the best standards. We incorporate professionalism and creativity in every aspect of the construction and installation to portray all the intended features as they appear in the design. Some ideas usually come up in the process that may alter the design. In recognition of this, we will take all the necessary measures to ensure that the pond is given the perfect touch to match the décor of your landscape and other features on the property. Swimming Pool Singapore is a licensed provider of custom solutions for garden ponds. With our products and services, you can be sure of the perfect bio and lily pond for a residential or commercial establishment. Obtaining all your products and services under one roof also comes with the advantage of affordability. We have an adequate team of professionals and resources to successfully handle all projects from start to completion. Whether you need design, construction and installation services for a small-sized or larger garden pond project, we can always deliver the best results with guaranteed satisfaction. 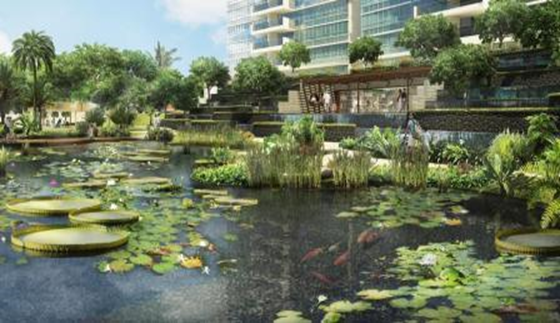 Talk to us now for customized and affordable design, construction, supply and installation of bio and lily pond Singapore.